a) On-line options last about 30 minutes to an hour, see third option below. b) Classroom courses last 2 1/2 to 4 hours in length depending on attendance. 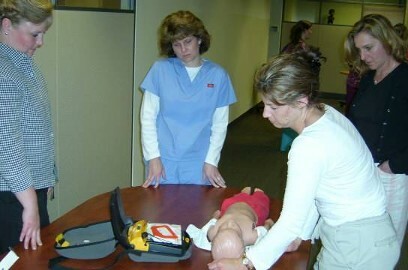 All materials needed to practice required skills, which including bag masks, mouth masks and AED's. Manuals are available during the class for student use, and additional manuals are available for purchase. This course can be 20 minutes (challenge option), or 20 minutes to an hour (on-line option), or 2 to 3 hours (classroom) in length and covers: all aspects of the initial course except at a much faster rate appropriate for retraining only. This course is designed for the proficient healthcare provider. Manuals are available during the class for student use, and additional manuals are available for purchase. 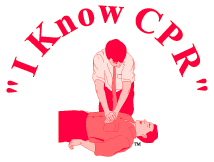 3) Contact "I Know CPR" to schedule the skills verification (parts 2 and 3). This option is quickly becoming a favorite of medical and dental facilities. It allows the participant to log on to AHA's web site from any internet connected computer, give their password and complete the cognitive portion of the course at their convienience. The participant will then print out a completion certificate. Upon presenting our instructor the printed course completion certificate (following the online completion) skills verifications are approximately 20-60 minutes depending on the number of people attending. Following successful completion of the skills verification the participant will receive the AHA BLS for the Healthcare Provider certification card which is valid and recognized by AHA for two year.